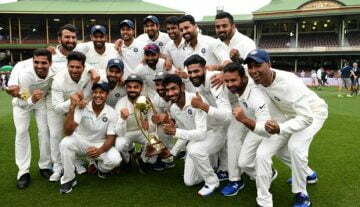 After the end of the limited-overs series, the visitors’ Indian cricket team will now play the long five-match Test series against the hosts England in their ongoing England tour, starting from August 1. Prior to the Test series, India just played a three-day warm-up game against Essex at County Ground (Chelmsford). After deciding to bat first, India scored 395 runs which Essex replied with 359/8 decl. The match ended after India put 89/2 on the board in their second innings as the match was drawn. Before beginning the Test series, we will look at the important scenarios of the Indian Test squad from the warm-up game. Indian left-handed opening batsman Shikhar Dhawan scored ducks in both innings. In this whole English tour, Dhawan has struggled to play the big knocks and now in the multi-day warm-up game, he failed to open his account in both innings. While Kohli has a good option for the opening slot as in-form opener KL Rahul, Shikhar Dhawan’s place for the upcoming Test series is under serious trouble, especially when Rahul played a good half-century knock of 58 runs in the first innings of the multi-day warm-up game.